A Year of Being Here: Linda Hogan: "Journey"
It doesn't remember the womb of its beginning. "Journey" by Linda Hogan. Text as published in Rounding the Human Corners: Poems (Coffee House Press, 2008). © Linda Hogan. Reprinted by permission of the poet. Linda Hogan is the author of many works of fiction, nonfiction and poetry, including The Book of Medicines: Poems. 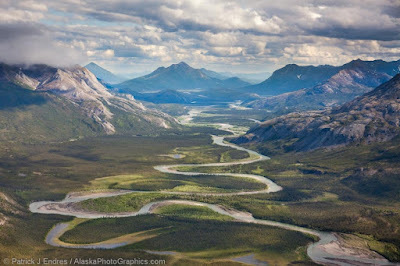 Art credit: "Alatna River," photograph by Patrick J. Endres / AlaskaPhotoGraphics.com.